Money doesn’t buy happiness. We all know that but it has been said that everyone would like to find out for themselves. I think that the majority of people strive to be happy but very few realize that happiness is a choice and it takes work. Sometimes it takes hard work. I don’t know about you but there are times when I don’t like myself and I don’t like my progress. These are the times when I need a strategy to “snap out of it”. I ask myself if my current standard of happiness is too high. I ask myself if it serves me when I am grumpy and upset. I write down reasons to be grateful for. 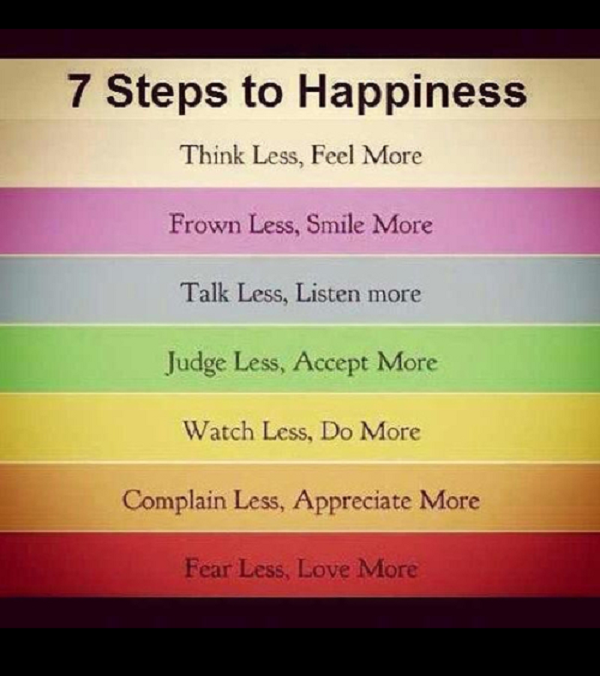 I go through these 7 steps of happiness – what an amazing reminder to live on a daily basis. Then I shift my focus – usually when I am dissatisfied, I give my attention to the wrong things. Go and give it a whirl. Maybe it works for you as well.